The security of a versatile camera strap lets you focus on the scene at hand. Crossbody style with padding, your camera will feel light and easy to handle. The SpeedCinch gives you security when travelling, allowing you to snug it close to your body, and the quick-draw system lets you grab the camera and move into shooting mode at a moment’s notice. Designed for DSLR, Mirrorless, and Pro DSLR cameras. Stainless-steel and aluminum mount secures camera to the strap via a ¼-20 thumbscrew. SpeedCinch System for close-to-body security, allows you to extend the strap quickly into shooting position. 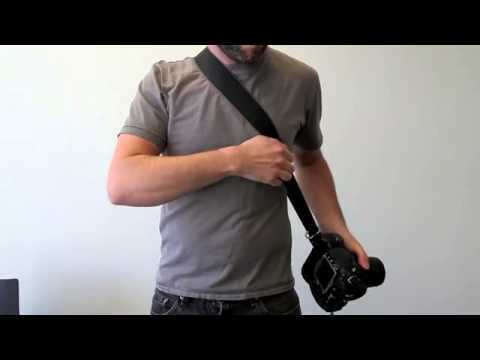 Back-up Dyneema tether attaches to your camera’s strap lug. Anti-slip grip provides comfort without bulk. Layered-Pad evenly distributes weight across your strongest shoulder muscles, protecting you from strain. Pivot ring allows you to adjust the angle of the strap to fit across your body.